All one has to do is pick up a newspaper, turn on the news, or go on social media and it’s clear – there is a real struggle between those who are well to do and those who are desperately trying to make ends meet…or even just trying to find the ends, forget trying to make them meet. When disability is thrown into that equation, the struggle becomes even more pronounced. The extra costs to a family that come with having a severely disabled child are often unseen, unconsidered, and not understood by those who could help alleviate this seemingly endless struggle to survive. These costs aren’t just monetary, though. Often times, families such as mine struggle in other ways. 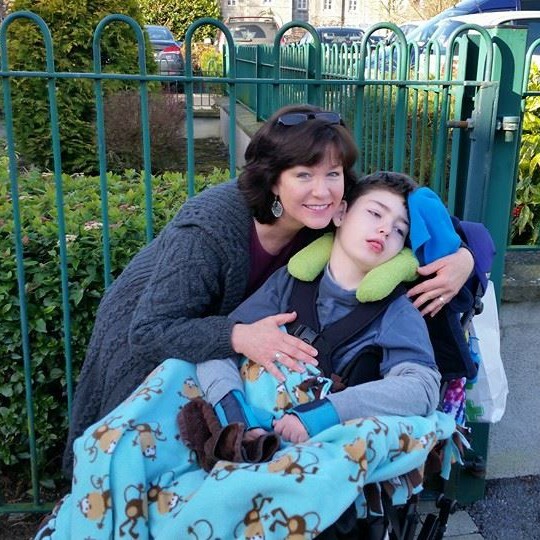 I’ve been searching for a suitable, accessible, rental home that will be closer to Brendan Bjorn’s school in north county Kildare and his medical services in Dublin. As his health declines, this is a vital move. It is also a financial move, as I cannot afford rent out of pocket – my pockets are empty – so I will be using the assistance of HAP. As it stands, the rental market is troubled with low supply, high rent prices, and inadequate rental assistance amounts. Now, imagine adding to those challenges the necessity of it being a disability-friendly home. That means a newer build with wider doorways and hallways, a bungalow or a 2 story home with a full bath and bedroom on the ground floor (nearly unheard of), and well-insulated to guard his fragile health. Oh yes, and somewhere close in cost to the €1,050 that HAP allows. I’ve phoned and emailed a number of letting agents. Many have been, how shall I say, not very helpful. Many don’t reply and those that do basically tell me it’s an impossible ask. I know what I require is complicated, but what can I do? And I am left wondering if the only time those with the power to provide proper assistance for families like mine are actually able to put themselves in my place…and I don’t mean the disabled parking place. I am left wondering if anyone truly understands the position that families like mine are left in when in need of a suitable, accessible home? Might I suggest here that a committee, or some type of official, national body, that assists families with disability housing needs be formed as soon as possible to help these families locate a home. On another note, next week is Carer’s Week. There will be a wide variety of events across Ireland for carers to attend – lunches, coffee mornings, walks, pamper events with manicures and massages, nights out with music and dancing – all to celebrate and treat the much deserving carers. But, how many of the nation’s carers can attend? I can’t. I’m housebound while my son is bedridden. I have no one to relieve me so I can go to any of those events. I will spend Carer’s Week caring. And I won’t be the only one, I am sure. I don’t think carers in my situation, that of being a lone-parent carer, are considered when it comes to scheduling events for carers. If we were, there would be respite nursing made available. There would be spa vouchers given to homebound carers to schedule a bit of pampering when their schedule actually allows. There would be a gift basket or a gift card sent to the housebound carers home, just to let them know they are not forgotten. I am left wondering, did the organisers truly try to put themselves in our place? Look, if the organisers of such well-intended events for carers are not even fully understanding the isolation, the struggle, and the inability to get out of the house that disability places on the entire family, then how can we expect the government officials who are not touched by disability, to understand? Having said that, I do not believe it is an excuse for either or them, or for anyone, to not understand. I believe in the greater ideals of community spirit, togetherness, and support through understanding. Maybe I’m not realistic in my beliefs, but I’d like to say it would make this world a far better place if more people shared those beliefs. The most vulnerable should not go unheard or unassisted. There must be equal, fair, humane treatment and rights. and not just when they park.